We do not worship, and Love a rampant-bull-in-a-china-shop God, instead the God we worship, and Love is the ultimate example of caring and tenderness. However, God can at one time be like a physical therapist who pushes us beyond our present condition, yet at the same time He can be more gentile then the soft landing of a butterfly. If God were a professional button pusher He’d know when and when not to push the right button to bring His Love and Faithfulness to fulfillment in your life. One bible study method is instructs us to read the verse until a portion or a word jumps out at us. When I read today’s scripture it reminds me of popcorn popping because all kinds of stuff are popping out of it, all of them relevant to my Faith Journey. “strength, power, protection, gathers, carries, gently leads,” each of those has graced me throughout my 71 years either singular or in groups. The portion of the 2 verses popping out at me remind me of not only where I am in life and also what God is doing to me and for me now, “He gently leads those that are nursing,” For example I have lived beyond the life expectancy of someone with pulmonary fibrosis primarily because God is faithfully and gently leading me and nursing me, day-by-day. That’s my carryover story, what your story? As we make our way through 2018 and beyond how does Isaiah 40:10-11 factor in your life? The scriptures tell us, “For I, Yahweh, have not changed, and you, O children of Jacob, have not perished.” (Malachi 3:6, LEB) We may not be children of Jacob, but we are children of God and if God does not change you can count on Him not only to “nurse you,” you can also count on Him to give you, “strength, power, protection, gathers, carries, gently leads,” as your need arises. 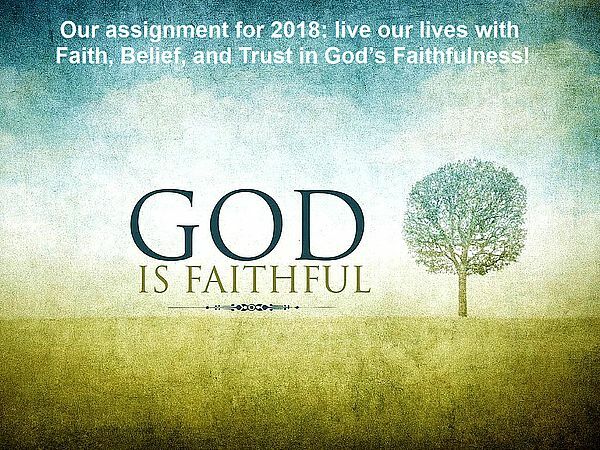 Therefore, our assignment for 2018: live our lives with Faith, Belief, and Trust in God’s Faithfulness! God’s faithfulness has been my watchword for 2017 but I’m of a mind to carry it right on into 2018 with anything else He wants to add. Your posts are encouraging. Thank you.